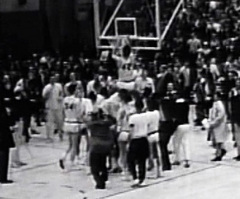 The 1964-1965 basketball season was an unprecedented season of success for the Princeton men’s team as it played some of the finest basketball in the country, led by All-American and captain Bill Bradley ’65. During that magical season, the Tigers won the Ivy League title and earned a trip to the NCAA tournament. By season’s end they had bested teams from Navy, Syracuse, Rutgers, Cornell, and Providence. 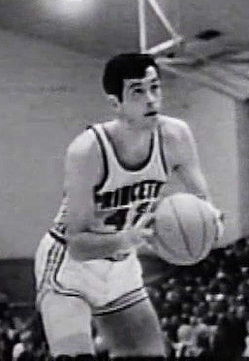 Bradley, arguably one of the best athletes ever to play at Princeton, led a talented group of juniors and up-and-coming sophomores as they demonstrated that an Ivy League team, devoid of scholarship players, could hold their own, and indeed, compete with basketball powerhouses such as Michigan and North Carolina State. Princeton’s season opened on December 2nd with an 83-74 victory over Lafayette College. Crowds filled Dillon Gymnasium to watch the team, and as the end of December approached, Princeton was 6-2. Then at New York City’s Madison Square Garden (2:34), where the annual Holiday Festival tournament was played, Princeton opened with a victory over Syracuse. But the match-up everyone was anxious to watch pitted Princeton against the University of Michigan — then the number one ranked team in the country. Michigan’s star player was Cazzie Russell, a versatile 6’ 6” all court player. Successful teams are rarely made by heroics or skills of just one player. 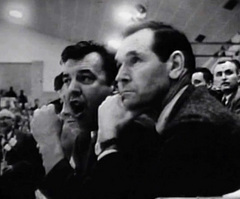 Bradley was coached by Butch van Breda Kolff ’45 (pictured below left). During his tenure from 19 62-1967, van Breda Kolff posted a 103-31 record, claimed four Ivy League championships, including three in a row, and took a team to the NCAA Final Four tournament. Van Breda Kolff’s teams were known for their strong defensive play and relied heavily on man-to-man defending. Deft ball handling skills, movement off the ball, and fast breaks were keys to his offensive strategy. 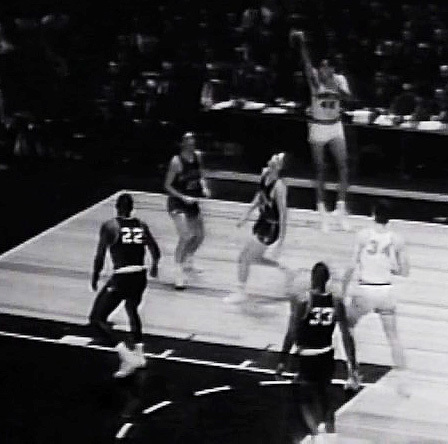 The NCAA tournament, often referred to now as “March Madness,” was a much smaller affair then, as only 23 teams vied for the national title (16:10). Princeton opened against Penn State in a game that was much closer than Tiger fans would have liked. Princeton squeaked by, thanks to Bradley’s second half contributions, with a 60-58 victory. They next faced North Carolina State University and defeated them more easily, earning a 66-48 win. 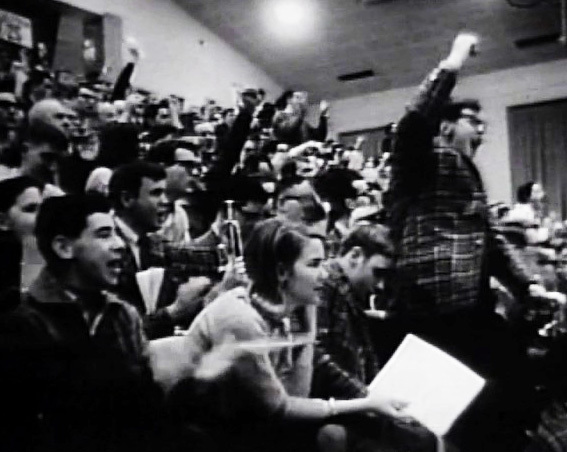 This KSP-60 U-matic video, produced by the Alumni Council of Princeton University, is part of the University Archives’ Historical Audiovisual Collection (item no. 1577). All images are stills from the film featured here. This entry was posted in Athletics by Mudd Manuscript Library. Bookmark the permalink. My brother Jim played for Penn State in the NCAA game shown about 1 minute into The Year of the Tiger video. He and Bob Weiss, who later played in the NBA and was a head coach in the NBA, are the only two starters for Penn State in that game who are still alive. My other brother Frank and I attended this game. Is there any why to get the full video of that Princeton/Penn State game? I like Bill Bradley today but boy did i despise him in 1965. I was a big Providence fan then and he single handedly beat my Friars. 109-69. It wasn’t the loss just how bad it was. I imagine Penn fans must feel the same about 1971 when they lost to Villanova in the Regional Finals 90-47. They(Penn) had beaten them by 8 about a month before. Nice article. It’s hard to imagine a team with no scholarship players competing with teams like Michigan and NC State. If that happened with today’s press coverage, during March madness, it would be considered the Cinderella story of the decade(or century). Mr. Bradley’s impressive political career can overshadow his athletic accomplishments, which it’s nice to remember, were extraordinary. Great article! I really felt I was in the stands rooting for the Tigers. I loved the footage and the cute little uniforms! I knew Bradley was a great basketball player, but I didn’t realize he was such a superstar. I like how he rejected the trappings of stardom in the NBA unlike today’s stars. He dressed modestly, spent wisely (his nickname was “Dollar Bill”), and used his spare time to sharpen his mind. I also think it’s interesting that Bradley and his biggest rival, Cazzie Russell, eventually played together on the same team, which probably helped strengthen his political skill of bipartisanship. This article was a great read. I wasn’t aware of the historical legacy left by the Princeton Tigers basketball team during their ’64-’65 season. Nor did I realize how valuable team captain, Bill Bradley, was to the team’s success. Infusing video reference times into the text was quiet smart of the author so you could quickly retrieve the part of the clip she was describing. It was refreshing to see a classic basketball team on the court. I enjoyed reading this wonderfully written article. Well done!